Eyes half-closed, I drowsily put my head around the door and saw Michael standing there. The dawn chorus had not yet started in Tomohon but there my guide stood, bouncing from toe to toe. I looked at his watch. 4.30am was writ large on the digital screen. “Didn’t we say 5.30?” I yawned. Making a mental note to improve my Indonesian, I nodded a vague yes and with a certain amount of groggy haste threw on my trekking gear. Not that it was a problem. Michael’s enthusiasm had rubbed off on me the previous night when we arranged to go on a sunrise hike to the crater of Mount Lokon; the active stratovolcano, twinned with its even bigger brother Empung, loomed over Tomohon and demanded further investigation. Although I was still following him somewhat robotically as we set off, my excitement rose as I made out Lokon’s peak. The deserted roads and lightening night sky served to create a murky, dreamlike atmosphere, and although the clanging soundtrack of a nearby factory seemed was at odds with our excursion into nature, a rising plume of smoke had piqued my interest. “Today?” I asked, taken aback. The motor still wasn’t fully running. Michael shook his head and laughed as we started our ascent. 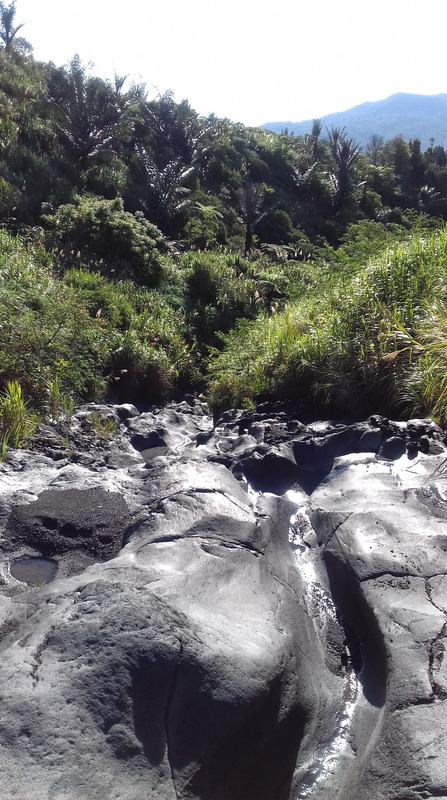 Although the climb was a gradual one, by the time we reached the dry lava trail constituting the main route to Lokon-Empung, I was covered in sweat. 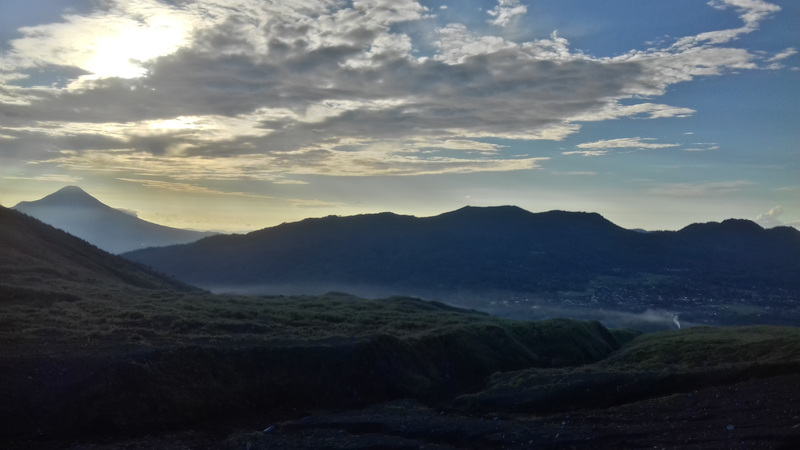 Tomohon may be located in the Highlands and as such offers a cooler climate than nearby Bitung or Manado, but even at 5.30am – my alarm had gone off – I had to take a breather. Under the guise of taking a photograph, I did so. Luckily, the sun was starting to emerge from behind distant Mount Klabat, Sulawesi’s tallest volcanic peak, and with the sky rapidly turning orange, I received a sudden burst of energy. I attacked the remainder of the route with renewed gusto. Dried-out waterfalls were effortlessly scaled – mostly – and barring the odd slip we had reached our destination with minutes to spare. The crater created a preternaturally still atmosphere. 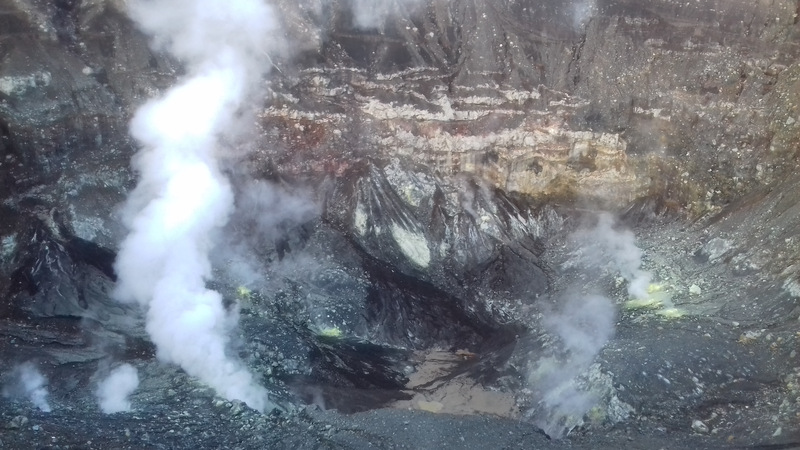 Its elemental power was palpable as smoke billowed and writhed from sulphur-splattered fissures at its base while the volcanic rocks strewn around the site bought to mind the surface of an undiscovered moon. It all seemed so calm. A makeshift grave disturbed my reverie. Michael explained to me how some visitors climb down into the crater itself; the drop is deceptively simple but a misplaced step can have tragic consequences. By now the sun had fully risen and was bathing the valley in light. Mount Mahawu – Tomohon’s ‘other’ volcano – reared up to the east while in the distance Lake Tondano lay shrouded in mist. I sat in respectful silence and watched the panorama unfold. As we headed back down, I took one final look at Lokon-Empung. The peaks sat impassively watching, standing guard over Tomohon, only hinting at the destructive power that lays beneath. Tagged Asia, Empung, Lokon, Southeast Asia, Tomohon, Volcano. Bookmark the permalink.